Retro Friday is a weekly meme hosted here at Angieville and focuses on reviewing books from the past. This can be an old favorite, an under-the-radar book you think deserves more attention, something woefully out-of-print, etc. Everyone is welcome to join in at any time! I include roundups from participating bloggers in my post every week. 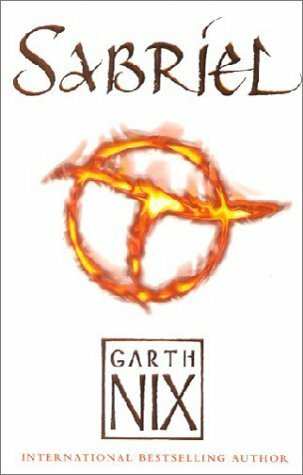 Garth Nix is a familiar name in the fantasy world and I first encountered him through the wonderful Sabriel . Nix is a member of that amazing and fast-growing collection of Australian young adult authors and one I would love to meet as his worlds are so expansive and well-thought-out. It would be fun to pick his brain about the creation process. This was another of those golden selections for my old Young Adult Reading Group and we had so many wonderful conversations surrounding the intricate and grim world Nix created and the memorable characters he populated it with. 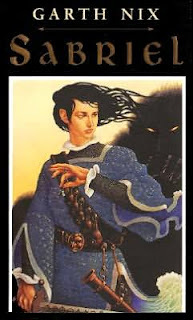 This is the first book in the Abhorsen trilogy, also known as the Old Kingdom series, and when I first read it only the first two books were out. This gave me time, however, to convince my husband he needed to read it as well and so we read it aloud together--another of those wonderful reading memories I cherish. He liked it just as much as I did. I don't hear it talked about as much these days, though, and so it seemed like a fine selection for a Retro Friday post. I ran across a couple of reviews of it recently that brought the story back to the forefront of my mind and reminded me why I loved it so the first time I read it several years ago. I'm also curious as to how many of you others out there have read it and what you thought. It all starts with the death of a small white rabbit. On the verge of finishing school at Wyverly College, 18-year-old Sabriel is a solid student and a respected prefect. She can also raise the dead. And after raising the rabbit to please a fellow student, she receives an unnerving message from her father. Certain he is in mortal danger, Sabriel arms herself with the sword he sent her and his bandolier of bells--the tools of the trade of a true necromancer. For that is what her father the Abhorsen is. Though rather than bring the dead back to life, he puts them back to rest once more or binds them if rest is impossible. Trained by her father, Sabriel knows he must be stuck in the land of the dead itself. So she chooses to leave school entirely, travel several miles to the wall that separates unmagical Ancelstierre from the wild Old Kingdom, and crosses over to search out her father and free him from whatever evil holds him captive. Used to being on her own, Sabriel is surprised to encounter companions along the way. The mysterious Mogget, who inhabits the form of a cat, but who is something much older and powerful than that. The unusual young man, frozen in time as the figurehead of a ship, who can no longer remember his name and goes by the name the mercurial Mogget gives him--Touchstone. Together the three of them forge ahead through the rivers and hallways and fountains of Death. Finally, they came to a large chamber, with a set of double doors to one side. Light leaked in from a large number of small, circular holes in the roof, or as Sabriel soon saw, through an overgrown lattice that had once been open air and sky. "That's the outside door," Touchstone said, unnecessarily. He snuffed out his candle, took Sabriel's, now little more than a stub of wax, and put both in a pocket stitched to the front of his kilt. Sabriel thought of joking about the hot wax and the potential for damage, but thought better of it. Touchstone was not the lighthearted type. "How does it open?" asked Sabriel, indicating the door. She couldn't see any handle, lock or key. Or any hinges, for that matter. Touchstone was silent, eyes unfocused and staring, then he laughed, a bitter little chuckle. "I don't remember! All the way up the stair, all the words and signals . . . and now useless. Useless!" "At least you got us up the steps," Sabriel pointed out, alarmed by the violence of his self-loathing. "I'd still be sitting by the spring, watching it bubble, if you hadn't come along." "You would have found the way out," Touchstone muttered. "Or Mogget would. Wood! Yes, that's what I deserve to be--"
"Touchstone," Mogget interrupted, hissing. "Shut up. You're to be useful, remember?" "Yes," replied Touchstone, visibly calming his breathing, composing his face. "I'm sorry, Mogget. Milady." "Please, please, just Sabriel," she said tiredly. "I've only just left school--I"m only eighteen! Calling me milady seems ridiculous." "Sabriel," Touchstone said tentatively. "I will try to remember. 'Milady' is a habit . . . it reminds me of my place in the world. It's easier for me--"
"I don't care what's easier for you!" Sabriel snapped. "Don't call me milady and stop acting like a halfwit! Just be yourself. Behave normally. I don't need a valet, I need a useful . . . friend!" "Very well, Sabriel," Touchstone said, with careful emphasis. He was angry now, but at least that was an improvement over servile, Sabriel thought. "Now," she said to the smirking Mogget. "Have you got any ideas about this door?" "Just one," replied Mogget, sliding between her legs and over to the thin line that marked the division between the two leaves of the door. "Push. One on each side." "Why not?" said Touchstone, shrugging. He took up a position, braced against the left side of the door, palms flat on the metal-studded wood. Sabriel hesitated, then did the same against the right. "One, two, three, push!" announced Mogget. Sabriel pushed on "three" and Touchstone on "push," so their combined effort took several seconds to synchronize. Then the doors creaked slowly open, sunshine spilling through in a bright bar, climbing from floor to ceiling, dust motes dancing in its progress. "It feels strange," said Touchstone, the wood humming beneath his hands like plucked lute strings. "I can hear voices," exclaimed Sabriel at the same time, her ears full of half-caught words, laughter, distant singing. "I can see time," whispered Mogget, so softly that his words were lost. That last line gives me shivers every time I read it. As does the entire book, really. Sabriel is the kind of heroine you dream of, amid so many lackluster and weak-willed leading ladies, she stands out like the clear, pure pealing of one of her father's bells. Highly recommended. I've been meaning to write a review of this one but I need to re-read it first. I even have a draft of the review in my blog, complete with a picture of the signed postcard that I got from Garth Nix. Sabriel was a lovely discovery for me. I would have to agree that I've never read anything like it. I was actually surprised that I ended up loving this because I'm not usually into dark fantasy. I highly recommend this book and I even think it stands well on its own. I mean you don't feel like it's part of a series because it ends well. I just had my husband read this - I ought to have him do a Memory Monday on it! I agree, a fabulous book. I'm going to have to agree with the other comments and say this is one of my favorite books. Unfortunately I didn't fall for the other two in the series like this one, but I'm excited to see he's going to write a 4th. This is such a wonderful, evocative series! You should try the audiobooks some time - Tim Curry reads them, and he does a fantastic Mogget. 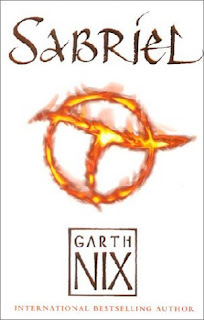 Confession Time: I've never read a Garth Nix book. Eek! I need to fix that, soon, it seems. Do you recommend starting with this one first? I adored this series, the end made me cry. I think I may have to re-read it now. Oh, I love this book, too! I was so glad it made Persnickety Snark's Top 100. I'm with Samantha R about not caring for Liarael and Abhorsen (but still being excited about book 4), and Darla D about the audiobook being awesome. I love Sabriel. I have reread Lirael a couple of times and it has grown on me (the fact that it's partly set in a library doesn't hurt). I can take or leave Abhorsen. I didn't know about the fourth book so I'm looking forward to that. This whole series is on my list of favorites! Well, maybe not Abhorsen, but I include it since it finishes the story arc... and I do like the way it ends very much. But I have to stick up for Lirael. She may not be as immediately likable as Sabriel, but she's an incredibly well-drawn character in her own way, and that makes the book a good read. Just goes to show that Nix is a versatile writer who really knows his stuff. celi.a, lol. Mostly but not completely indeed. It really is such a great book. Appealing to both boys and girls as well. Chachic, ooh, signed postcard! And it definitely stands on its own. I love the way it ends. Raspberry, you should! My husband loved it, too. Samantha, agreed. The other two don't quite live up to the promise of SABRIEL. But the 4th one is very exciting indeed. Darla, oh my word. Tim Curry does the audiobook? I must hear this immediately. Michelle, this is absolutely the place to start. A great read that can stand on its own. Alexa, I know what you mean. It's such a scary world that you're that much more attached to and worried about the characters in it. Trisha, yes! I was delighted to see it on Adele's list as well. And I agree about the other two. Though I really did enjoy LIRAEL. Just not as much as SABRIEL. Liz, that's good to hear. And I completely agree about the library aspect of it. That delighted me right away. Mary, yes on your comments about Lirael herself. I loved her. I guess I wanted a bit more for her than she got. But I always liked her. And he really is a versatile writer. So interested to see what book #4 will be like. Ever read a book a long, long time ago, but still remember bits and pieces? Scenes from this book stuck w/ me, but I had no idea what book it was. Then you described the bells and the wall and I was thrilled to finally know the title of the book. I really enjoyed this when I read it. Now I'll have to buy it again. Tempted to buy the audio book just for Tim Curry. I have read all of the Keys to the Kingdom series, and borrowed this one a couple of times, but still haven't read it! Sounds as though I need to make it a priority. Marg, I think you'd love it. I have the first couple Keys to the Kingdom books and have been sort of saving them to read with my son. Thanks for the linkage to my review. It's a great trilogy. Also love your "Team Gale" widget! It looks like we have a lot of overlap in our favorite authors. Hey, thanks for linking to my review! I really loved Sabriel, it was so much more thoughtful and complex than a lot of YA fantasy, and the use of language wasn't dumbed down at all. Looking forward to Lirael. You have a great blog! I'll be following.